Acupuncture has been shown to be to be a natural way to help control and reduce your cravings for nicotine if you are trying to stop smoking for good. Traditional Eastern medicines such as Acupuncture and Chinese herbs may not be as well acknowledged in western medicine as nicotine gum and patches but they offer equal relief. In the immediate phase of withdrawal you can suffer especially with cravings, irritability and fatigue but acupuncture can help relive these symptoms. People use acupuncture to help when they are quitting smoking for a number of reasons. Some people can’t stand the alternatives such as patches and gum and see acupuncture as a more suitable alternative. Also, unlike medications, acupuncture has no side effects and can in fact help improve your mood and sleeping pattern. When receiving acupuncture you will find that the ears will be targeted the most as there are specific pressure found in this area of the body that effectively suppress cravings. 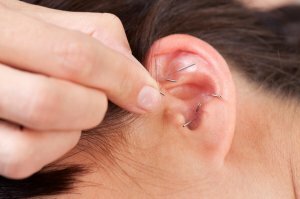 The National Acupuncture Detoxification Association supports an entire protocol around this set of ear suppression points for addiction. In between treatments, ‘ear seeds’ can be used by patients as a means of self-treatment. This technique involves placing tiny balls on the ears with tape to target the specific pressure points. Acupuncture is shown to be even more effective when combined with other means of traditional medicines as part of a multidisciplinary approach. Chinese herbs have been shown to help decrease the urge to smoke and help with the initial withdrawal symptoms. Each treatment is specially customised by a herbalist for the individual patient based on what they need and to make sure that the herbs are safely used and are properly metabolising in the liver and kidney. Hypnotherapy can also be used to help train the subconscious to not crave tobacco whilst acupuncture will work alongside this to help the patient deal with the physical withdrawal symptoms. Regardless of which treatments you choose to help you stop smoking, it will be a worthwhile process for your long term health as quitting smoking is one of the healthiest changes you can make. Could you benefit from Battlefield Acupuncture? Acupuncture for everyone, including celebrities!